I found it interesting that Miranda’s family, aside from an attempt at growing vegetables, were still pretty much at the mercy of what they could purchase to eat. They had to live in hope that the electricity would come back some day. And I got depressed realizing I wouldn’t do much better! So, this was a well-written story, with lots of food for thought. But now I’m going to look for something light and cheerful to read! Morgan Road Books, New York, 2007. 269 pages. One thing I learned from reading The Script and from talking with many women whose husbands left them: In such a situation, the relationship is going to get overcome by lies. The whole “Script” is based on asserting that it is all the wife’s fault that the husband is cheating. Many people in broken relationships find that even worse than the betrayal itself is the knowledge that the one you love lied to you over and over and over again. If you are accustomed to believing this person (and you certainly should be), then the lies, which become more and more outrageous, are crazy-making. When her husband finally admitted his adultery, one friend found that all she could say was, “I thought I was crazy!” Trying to believe lies coming from the one you love–lies designed to shift the blame off of him to you–is demoralizing and devastating. The Gaslight Effect is a powerful and moving book, showing how emotional manipulation can grow from subtle beginnings–and how to break free. This classic 1944 film is the story of Paula, a young, vulnerable singer who marries Gregory, a charismatic, mysterious older man. Unbeknownst to Paula, her beloved husband is trying to drive her insane in order to take over her inheritance. He continually tells her she is ill and fragile, rearranges household items and then accuses her of doing so, and most deviously of all, manipulates the gas so that she sees the lights dim for no apparent reason. Under the spell of her husband’s diabolical scheme, Paula starts to believe that she is going mad. Confused and scared, she begins to act hysterical, actually becoming the fragile, disoriented person that he keeps telling her she is. In a vicious downward spiral, the more she doubts herself, the more confused and hysterical she becomes. She is desperate for her husband to approve of her and to tell her he loves her, but he keeps refusing to do so, insisting she is insane. Her return to sanity and self-assertion comes only when a police inspector reassures her that he, too, sees the dimming of the light. Dr. Stern shows us examples of gaslighters in many different situations: lovers, spouses, parents, and bosses can all be gaslighters. Dr. Stern assures us that even capable, confident women and men fall into the role of gaslightee, much to their own astonishment–if they even realize why they are so demoralized. The problem is, gaslighting is insidious. It plays on our worst fears, our most anxious thoughts, our deepest wishes to be understood, appreciated, and loved. When someone we trust, respect, or love speaks with great certainty–especially if there’s a grain of truth in his words, or if he’s hit on one of our pet anxieties–it can be very difficult not to believe him. And when we idealize the gaslighter–when we want to see him as the love of our life, an admirable boss, or a wonderful parent–then we have even more difficulty sticking to our own sense of reality. our gaslighter needs to be right, we need to win his approval, and so the gaslighting goes on. It does take two for the Gaslight Effect to happen. If there’s even a little piece of you that thinks you’re not good enough by yourself–if even a small part of you feels you need your gaslighter’s love or approval to be whole–then you are susceptible to gaslighting. This book is eye-opening. She shows how the gaslighting goes in stages. You begin with disbelief, thinking you’ve misunderstood, or that the gaslighter didn’t really mean it. In the second stage, you start defending yourself. You search for evidence to prove your gaslighter wrong and argue with him obsessively, often in your head, desperately trying to win his approval. The third, exhausting, overwhelming stage is depression. “At this point, you are actively trying to prove that your gaslighter is right, because then maybe you could do things his way and finally win his approval. The third stage is epitomized by the woman apologizing profusely, repeatedly and obsessively to her husband for what he claims is years of bad behavior as she desperately begs him to forgive her–but nothing she can possibly say or do will ever win his forgiveness. However, he honestly comes to believe–and does everything he can to convince her–that she simply did not measure up, and he could not stay married to someone like her. That’s a much more comfortable story than the idea that he betrayed her. Dr. Stern illuminates the whole process. She lets you understand how it can happen, even between two good people. But the real power in this book is that she teaches you how to stop the gaslighting. Fortunately, there is a solution to the problem of gaslighting. The key to freeing yourself from this crippling syndrome isn’t easy, but it is simple. All you have to do is understand that you are already a good, capable, and lovable person who doesn’t need an idealized partner to provide approval. Of course, this is easier said than done. But when you realize that you alone can define your sense of self–that you are a worthy person who deserves to be loved, regardless of what your gaslighter thinks–you’ve taken the first step toward freedom. I like it that Dr. Stern doesn’t simply tell you to leave such a relationship. She helps you figure out if you can end the gaslighting but keep the relationship, or not. Especially crucial is that she shows you that you have the power to stop the gaslighting even if the one doing the gaslighting doesn’t cooperate. Although from the outside gaslighting can look like the work of a single, abusive gaslighter, a gaslighting relationship always involves the active participation of two people. That is, in fact, the good news. If you’re caught in a gaslighting relationship, you may not be able to change the gaslighter’s behavior, but you can certainly change your own. Again, it’s not easy, but it is simple: You can end the gaslighting as soon as you stop trying to win the argument or convince your gaslighter to be reasonable. Instead, you can simply opt out. 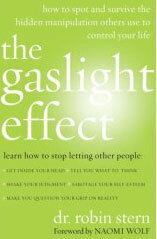 There are some good tips for opting out of gaslighting on small levels as well as on big levels. If you know what happened, you don’t need to argue about it. In fact, arguing about it will only make you feel crazy. Debating something basic–“I was not gone for twenty minutes”; “I am not threatened by this job”; “I never agreed to make a cake at the last minute”–suggests that reality is in fact open to debate, and that you’d change your position if you heard a good argument. It’s an inviation to your gaslighter to batter you with facts or emotional statements until you finally give in. Would you argue with a four-year-old about whether the moon can fall onto the earth, or whether candy is a good substitue for vegetables, or whether he can stay up all night and never get tired? No, because you know you’re right, and nothing the four-year-old can say will change your mind. More important, you want him to get the message that you’re not open to argument about these topics; you know what’s true, and that’s the end of it. Even though your gaslighter is not a child, it’s important to give him the same message: Some things are not open to debate. I love that illustration, because once my three-year-old son threw a temper tantrum for a full hour in the middle of the night because he wanted to “stay up all night and all day”! That actually caused me much less turmoil than when he had protested against naptime. I felt very ambivalent about the naps–He seemed to be outgrowing the need for them. However, when he told his plan about staying up all night and all day, I didn’t question my grasp of the facts for a moment. Although I wanted him to stop crying so I could go to sleep, I definitely didn’t try to argue with him, and there was no self-doubt whatsoever. If your husband tells you that you threatened to leave him when you know full well that you never intended any such thing–why debate? Though maybe he misunderstood your words, there is no reason to argue about your motives. You know what they were, and it’s time to simply tell him that you disagree and refuse to engage in debate. Perhaps that would be a good time to picture a raging toddler in your mind. It’s not a time for reasoning. Don’t get caught in worrying about who’s right and who’s wrong. The important thing is not who can win the argument but how you want to be treated. Dr. Stern gives many strategies and ideas to try to empower you to be able to opt out of arguments which only mire you in gaslighting. Gaslighting isn’t always as serious as cheating. Dr. Stern tells us about many different types of gaslighters, like the “Glamour Gaslighter” who is all charm and sweetness on the surface. But if he gives a gift that you don’t like, or maybe is in the mood for romance when you’re not, suddenly you’re inadequate, you’re the bad person. If you’re involved with a Glamour Gaslighter, you may be nodding in recognition– yet still feeling confused. You can see the behavior, but you’re still not quite sure why it’s such a problem. Well, I can tell you why: At least some–and maybe all–of the time, your gaslighter is completely involved in proving to himself what a romantic guy he is. That’s his version of the gaslighter’s need to be right. he looks like he’s relating to you, but he’s really only involved with himself. The actions he chooses to fulfill his needs may seem loving, attentive, and satisfying, but his lack of genuine connection with you leaves you feeling lonely. He’ll do his share–and more–of the household and relationship work. Yet you never quite feel as though he’s fully participating. And when you ask for emotional reassurance or try to connect with him more deeply, he’ll look at you blankly. Why, you wonder, are you so selfish and demanding? This category also includes spouses who “give in” and do something they clearly don’t want to do, then hold it over your head. Of course, the gaslighter in this situation is entitled to refuse to spend yet another day with your family. But he’s not refusing, he’s engaging in gaslighting, trying to make himself look like a good guy instead of being clear about what he wants. If you’re involved with a guy like this, you can easily become confused. One of the greatest dangers of Stage 3 is your increased loss of perspective. Feeling defeated, hopeless, and joyless may now come to seem so normal that you can’t remember your life ever was any other way…. To me, the worst aspect of Stage 3 is the hopelessness. Like all gaslightees, you have idealized the gaslighter and wish desperately for his approval. But by Stage 3, you’ve pretty much given up on believing that you’ll ever get it. As a result, you think the worst of yourself. As she describes Stage 3 gaslighting, I still found the Glamour Gaslighter and the Good-Guy Gaslighter the most eye-opening. They sound so nice. Even reading the description it’s hard to see what’s wrong with that approach–yet clearly that’s what makes this behavior so crazy-making. A Glamour Gaslighter is putting on a big show for his own benefit while trying to convince his gaslighter that it’s all for her benefit. He tells his partner she should enjoy his romantic gestures, but he’s not really checking in with her to see if she does. He’s just putting on a show and insisting that she enjoy it. A Good-Guy Gaslighter is getting his own way while trying to convince his wife that she’s getting her way. Or he’s withholding a part of himself while trying to convince his wife that he’s giving his all and encouraging her to think she’s crazy for wanting more. As a result, the gaslighted woman feels lonel, confused, and frustrated, but she can’t say why. Those of us who stay in gaslighting relationships have decided–usually unconsciously–that we need to be able to tolerate anything, and that we have the power to fix anything. Melanie, for example, needed to belive that she was a kind, nurturing person whose all-encompassing love would create–single-handedly if necessary–a happy marriage. No matter how badly Jordan behaved, she should, she could, and she would be loving enough to make things work. Facing how unhappy she was with Jordan meant giving up this idealized version of herself and accepting that she couldn’t overcome her husband’s difficult ways solely through the power of her love. I was convicted when I read that, because I cling to the idea that I made a vow, and that vow was for better or worse. But when I read this book, I had to realize that no, I’m not supposed to tolerate anything. Am I trying to get to the place where unfaithfulness and abandonment don’t bother me? No, that’s not a healthy relationship. My goal should definitely not be to get to a place where lies don’t bother me, or to get to a place where I let my husband tell me what I should be feeling. This is not about pretending that everything’s fine when it clearly isn’t. No matter how badly he behaves, it doesn’t matter, because we are strong enough (or forgiving enough, or nurturing enough) to transcend it. If we are not larger than life in our capacity to change him, then we are larger than life in our capacity to put up with him. The good news is that if we have the courage to leave these gaslighting relationships and look honestly at what they’ve cost us, we can begin to see an end to the terrible fear that’s been haunting us our entire lives–the fear of being unloved and alone…. We can see how full of love the world is–how many loving friends and supportive colleagues and potential life partners might enter our lives to replace that single “soul mate” on whom we’ve depended so heavily. If we can see that our true selves don’t really depend on another person’s maintenance, that we are no longer the helpless infants or young children who needed so desperately to turn our parents into heroes, then we can finally begin to enjoy the people in our lives for who they are, rather than needing them to be the good parents we never had. We can become our own parents, caring for ourselves, so that our romantic partnerships and work relationships and friendships are based on love and desire, not on need and desperation. Of course, the important part of the book is where Dr. Stern helps us learn how to turn off the gas. You can change a gaslighting relationship only when you are willing to leave it, even if you never actually have to leave. But you need to become comfortable with the idea that you and your gaslighter are each allowed to have your own thoughts, so that you neither have to give in to his negative view of you nor have to convince him to validate you as good. I also want you to remember that changing your own behavior is an extraordinary achievement and one that will repay you handsomely for the rest of your life. Whether you’re able to save this relationship or not, the changes you make in yourself will stand you in good stead for a healthy, happy, and satisfying relationship in the future, either with your current gaslighter or with someone else. You may also be amazed at how all sorts of things in your life begin changing–how your relationships to work, friends, partner, family, and the world at large are all improved by your efforts to turn off the gas in any other part of your life. So even while you’re mourning the loss of what you may be giving up, remember to celebrate or at least appreciate the things you’re gaining. One of the most soul-destroying aspects of being treated badly is the message we give ourselves that we deserve it. And as we seek to become more responsible and understand how we, too, participate in the destructive dynamics we’re trying to escape, we can come to feel that we really do deserve to be treated badly. After all, we participated. We argued with our gaslighter, or submitted to him, or gave him the message that we didn’t mind. We tried to control the situation or sought to make ourselves feel secure. Therefore, we’re just as guilty as he is, and we deserve whatever happens to us, right? Wrong. The goal of this process is not berate yourself, burden yourself with guilt, or apportion blame. Your only goal is to change your situation for the better. In order to do that, you need to know how you, too, are contributing to the problem and what you might do to alter it. But that’s very different from deciding that you “deserve” what’s happening or that you are somehow “to blame” for it. I know one of my own biggest hooks in the gaslighting process was my desperate wish to get my ex-husband to agree that I was right. I simply couldn’t stand that he thought it was okay to be three hours late, and that the problem was my oversensitivity, so I’d argue with him endlessly, trying to get him to change his mind. I now see that I was just as committed to controlling his thoughts as he was to controlling mine. For example, when he’d come home three hours late and I’d object, he’d go all-out to convince me I was being unreasonable, unspontaneous, overly controlling. But I was equally committed to convincing him that my frustration was justified. Twenty years later, I still think I was right and he was wrong–of course my frustration was justified! But that’s beside the point. What kept me locked into the Gaslight Tango was my inability to accept that my husband was going to see things his own way, regardless of what I did. If he wanted to think I was unreasonable, he would, no matter how hard I argued or how upset I got. As soon as I understood that he–and he alone–had power over his own thoughts, no matter how right I might be, and that he wasn’t going to change, no matter what I said or did, I took a significant step toward freedom. I found this book inspiring, thought-provoking, eye-opening, and tremendously helpful. It helped me understand some of the things that went wrong in my marriage. And it gave me hope that I can break out of some of those old patterns. Maybe best of all, it reminded me that I am a valuable, worthwhile person totally apart from my romantic relationship. That breaking up a relationship does not diminish me as a person–and may even build me up. That it’s not about me being forgiving enough or loving enough to not be bothered by a bad situation. This book helps me face life with hope and joy. Like The Script, it casts the light of truth on a bad situation, motivating change. Moody Publishers, Chicago, 2006. 316 pages. Cal, I don’t know how to say it, so I’ll say it. The League of Ten Friends is no more; the Decaphiloi have vanished, and the Academy of Socrates in Palestine is dissolved. Our little school has ceased to exist. Callimachus—it’s as if it never was…. Of the Decaphiloi, I give this present accounting—accurate or inaccurate as it may be, it is all I have, and that from the riffraff. Six members—whereabouts unknown. One member was murdered in a most horrifying manner; I shall not put it on parchment. One is allegedly a priestess in a temple of Dionysus—you read right, Dionysus. Don’t be alarmed: I’ve forsworn all things Dionysiac, you know that, Cal. Anyway, one member committed suicide. And one . . . one is a madman. This is what Tallis writes back from Palestine to Callimachus, his employer in Athens. Madman is a historical novel based on an incident mentioned in three of the Gospels, where Jesus casts demons out of a man possessed by a legion of demons. I’m not generally a fan of historical novels based on Biblical characters, but this was a perfect topic. There’s not a lot said about the demon-possessed man in the Bible, so there was plenty of room for the author to create his life story and a plausible, interesting background as to how he wound up in the tombs, out of his mind. The author worked in all the details, including explaining the second demon-possessed man of one account, the chains the man would break, and his fame throughout the region. In all of the Gospel accounts, Jesus calmed the storm—a “furious squall”—just before healing the demon-possessed man. I thought the author was insightful in writing that squall as a demonic attack—the demons knew Jesus was coming and tried to stop him. The author helped me realize that Jesus cared enough to go across the lake to deliver that man—and indeed the whole region—from the evil that had overtaken him. But that story is not the bulk of the book. Most of the story is about Tallis’s investigation of what became of the Socratic school his employer founded in Palestine. The answers are bound up in the horrible rituals of the Dionysian cult of the day. The author draws you in to the story about Tallis, as he discovers great evil, and tries to do his part to try to stop it. A big thank you to Bethany for loaning this book to me. 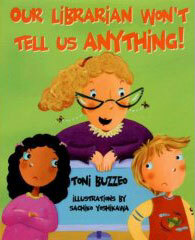 Our Librarian Won’t Tell Us Anything! Upstart Books, Fort Atkinson, Wisconsin, 2006. Here’s a book any librarian will love. Carmen is right – sort of. Mrs. Skorupski doesn’t tell him where the animal books are. However, she does show him how to look up the books he wants on the computer and use the shelf labels to find them. Later, Mrs. Skorupski doesn’t find him a good online article for his report. But she does show him how to find one. You get the idea! This is a fun story, and along the way it shows some of the many wonderful ways a librarian can empower you—even without telling you anything! I was not surprised to learn that the author is a School Library Media Specialist herself. As a brand-new children’s librarian, this book has a special place in my heart. Houghton Mifflin, Boston, 2007. 40 pages. This book is a delight to read, if only for the amazing intricate detail of Steve Jenkins’ cut-paper illustrations. A Caldecott winner for Actual Size, his art work is stunningly life like. This book features interesting facts about dogs on one half. Flip the book over to learn interesting facts about cats. The illustrations show many different breeds, types, and behaviors. Anyone will enjoy browsing through this book. It’s a perfect way to intrigue an elementary-age child with the wonders of nonfiction. Little, Brown, and Company, New York, 2007. 230 pages. I read it simply because it had gotten a lot of attention on the listserv for young adult librarians. Some complained about some edgy content—like masturbation—and I tend to be sensitive to content like that, and don’t like things like that thrown in gratuitously, so I suspected I wouldn’t like it. It also sounded like a book with an agenda—the Native Americans were pushing it so hard—that I suspected I wouldn’t like it. Well, I loved it. I don’t blame the Native Americans for urging us all to read it. I’m going to urge everyone to read it, and if I had a background at all similar to his, I know I’d be that much more vehement. If the book has an agenda, it’s so sensitively carried out, you don’t feel like you’re reading a message—just a wonderfully crafted story. I’m going to try very hard to get my 13-year-old son to read it, though if he ends up waiting a few years, that’s okay, too. Yes, conservative parents will probably want to prescreen this book before giving it to a younger teen. The book presents a hard look at tough realities of poverty—while keeping the readers laughing. “Junior” Arnold Spirit, at fourteen, is a budding cartoonist. I draw because words are too unpredictable. I draw because words are too limited. If you speak and write in English, or Spanish, or Chinese, or any other language, then only a certain percentage of human beings will get your meaning. But when you draw a picture, everybody can understand it. When Junior starts high school, and is given a math book so old it has his mother’s name in it, he gets mad. The consequences of his angry reaction include Junior being advised to leave the reservation and attend the high school in Reardan, twenty-two miles outside the rez. Junior goes to Reardan, but the others on the rez hate him for it—especially Rowdy, who’s been his best friend all his life. They stared at me, the Indian boy with the black eye and swollen nose, my going-away gifts from Rowdy. Those white kids couldn’t believe their eyes. They stared at me like I was Bigfoot or a UFO. What was I doing at Reardan, whose mascot was an Indian, thereby making me the only other Indian in town? The story of Junior’s freshman year at Reardan includes basketball showdowns between his new school and the reservation’s team—featuring his friend Rowdy. He navigates the scary world of a white high school, makes some friends, and suffers way more than his share of tragic losses. That’s the true genius of this book. Sherman Alexie deals with some dreadful situations, but he effectively mixes in laughter, and the reader comes away with overwhelming hope, instead of the despair you would think you’d feel after reading a book about poverty and death and limited opportunities. This book gave me a window into a world I knew little about, and it did it with affection, compassion, and pride. I picked up this book at bedtime, and kept reading until I finished it. When I did, I set it down with a smile on my face. A wonderful and satisfying read. World-broadening, moving, and uplifting. Conari Press, San Francisco, 2007. 220 pages. Here are 50 practical tips for handling life’s transitions from a group of friends who has been through more than their share of transitions. Collectively, we have experienced the extreme joys and deep sorrows that life offers up. From mundane moments to the dramatic and surreal, we have a history of six marriages, ten children, four stepchildren, six dogs, two miscarriages, two cats, twelve koi fish, a failed adoption, widowhood, and foster parenthood. We have built companies, lost companies, and sold companies. One of us was shot and left for dead on a tarmac in South America, and two of us have lived through the deaths of spouses. These ladies learned life’s lessons the hard way—and now they offer up their own wisdom, and the wisdom of others, for the rest of us to learn from. They do so with bucketfuls of grace and humor. When left on the tarmac, begin to walk. Be willing to make great mistakes. Give up thinking you can do it all. Trust in God, but row away from the rocks. Know it’s the obstacles in the stream that make it sing. Let yourself cry when Tinkerbell dies. Recognize that chocolate melts in order to take a new form. When dreams turn to dust, vacuum. The tips are even more charming when combined with the stories and wisdom and humor offered along with them. This is a lovely and empowering book. I especially recommend it for women going through a time of transition. (Most of us?) We will make it through, and we can be all the better for the experience. This book will help you survive and thrive. From kitchen conversations to the thousands of conversations we’ve had with women from all over the world, we learned that the problem-free life we sought was more than an illusion. It had become a myth to which many women had fallen victim. A woman’s life is much more than success, having it all, or the elusive balance we all seek. It is more than seeking perfection or conquering the world (although you might). It is more than gritting your teeth and making it through. It is about surviving and thriving. Surviving and thriving meant taking what life offered up and looking for the opportunities, the joy, and the compassion in less-than-pleasant or less-than-perfect circumstances. It meant cultivating the collective willpower to move up and move on, or move out, even when the process broke our hearts. It meant recruiting support and building the confidence to trust when life’s legendary curveballs were thrown, we would have the willpower, support, and courage to move forward. The phrase “survive and thrive” became a perfect descriptor of our journeys as friends. Together we would navigate through some tricky times. You are currently browsing the Sonderbooks blog archives for February, 2008.